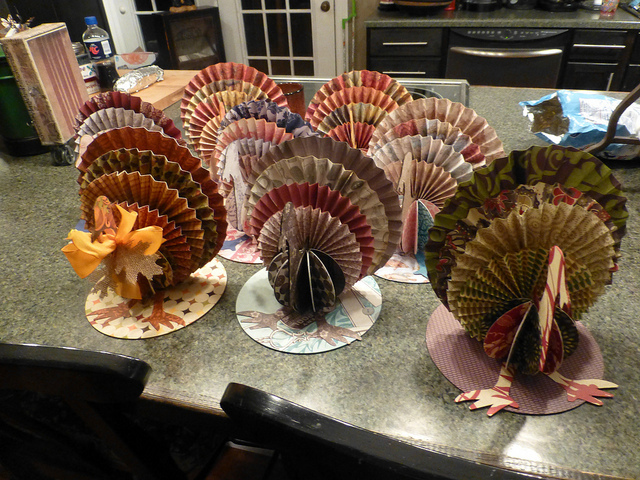 The Gentleman Crafter: I'm All Turkeyed Out! Actually, I should say good morning all! It's been a late night...1:30 a.m. LOL! I've been making turkeys all night long! First is was a video showing you all how to make one, then I got the bright idea I would make seven more for friends at work! AM I CRAZY! LOL! Here is the link to the pattern at Archiver's...HERE.. So, here are all my turkeys lined up in a row...Kinda! How To Make the Archiver's Turkey! Thanks Tons For Coming by! Please show us your trees when you get them decorated...I have never seen anyone that does that many trees...LOL! You are a turkey! Love these guys. Saw similar last year. I love playing with the pleated circles. I made xmas trees with them. My hint... score the whole 12 X 12 sheet before cutting. For some reason it seems faster when you score it first. When we getting together to get Dylusional? I have 8 of the 12 colors now. Your turkeys are so fun, best 30 minutes ever. Loved hearing you talk about the trees. When I had the big house still I had 5 trees. My kitchen tree had antique cookie cutters, children's dish sets and antique red enameled kitchen utensils. We also made and hung cookies on it every year. Loved it. These are so cute...may try to make one with my granddaughter tomorrow. Hope you have a wonderful Thanksgiving, Jim! Jim they are all fantastic! The videos are great! I picked up the turkey pattern from Archiver's website thanks for the info. I hope you continue with the decorating of tree number four in the next video. I loved shopping for Christmas ornaments when I was in Germany. I love hearing about your family. I also like stories about people. You are fun and funny to watch and I love seeing you struggle with getting something to work and how it ultimately comes together. You are one of my favorite blogs and I am very thankful for you. Happy Thanksgiving. Jim they look great. Gobble Gobble!!LOL. Great turkeys! My sisters table is going to look fab with the pumpkin name tags and a turkey on it. thanks as always for sharing. Jim, thanks for sharing the resources with us and your video. I actually made Tims smaller version last year, but I love the size of these. Much larger. I made one, for my table, and loved how it turned out. Wish now that I had made more. Another fun projects for my neices while the turkey is cooking if I have the time to sit with them long enough. Happy Thanksgiving to you and yours. Enjoyed listening to your story through the videos. Your father and mine had so many similarities. Dad was the creative one in our family as well, and was multi talented in so many areas from brickwork,ironwork, woodworking, and even upholstry. I lost my dad when I was 18 a few days before Thanksgiving. So I reflect alot on him this time of year and am so thankful for the years I did have with him. I was definitely a Daddy's girl. Thanks for the videos! I am such a visual learner!! These turkeys turned out so cute!! Happy Thanksgiving!! Wow. I watched all three videos in one go and what a treat that was! Loved all your stories of family, trees, turkeys had me LOL at times. I love that you do not take yourself seriously you are very special Jim. Thanks for sharing. I finally got to see the 3rd video tonight and I have to tell you that I giggled through all three videos; Mr Tom came out really cute! And I really enjoyed the stories of your family and your "babies", and I hope you let the cat back in too! Happy Thanksgiving to you and yours! Jim, loved your Tom Turkey video. Your narration along with the how-to was fabulous. I so enjoyed hearing about your family. My dad was like yours and could make almost anything out of wood. He never used a pattern and made my mom and I some beautiful furniture. He was also born in Austin. Keep up the great videos. You are so very talented and a great inspiration for me. I'm playing catch up here! I loved all three videos and feel priviledged to hear all about your family and your menagerie. Mr Tom turned out really well - it's such a shame that we don't have Thanksgiving in the UK or I would have made one myself. I am thankful for you and your blog though - you make me smile, so thank you Jim. Too cute...but can't download turkey head...can you send it to me..